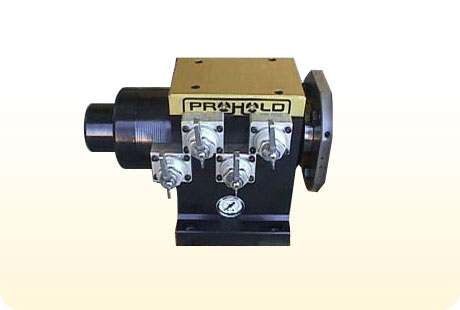 Hydraulic tailstock units have a rigid steel body with a precision tapered roller bearing mounted trunion. Fingertip control is all that is needed to open and close chucks, vises or dedicated-type tooling setups. It can be supplied with an integral internal brake for a rigid rotational trunion lockup during machining operations, or simply as an end support device with a built in rotary union to supply hydraulics to the fourth axis fixturing to which it is attached. With the integral brake, the work is now locked and supported at both ends, the indexer and the tailstock. This allows for more aggressive stock removal away from the center line of index and adds the ability to produce a more dimensionally accurate finished workpiece. The brake is turned on and off automatically by a signal from the machine tool control via an “M” code sent directly to the PROHOLD® hydraulic pump unit. A good example of the performance of this tailstock/brake unit is a milling application of six cylinder diesel engine heads. These were machined on a large VMC, one pass, with a 12” dia. multi insert shell mill. With a conventional tailstock end support, there was as much as .004” out of flat and “twist” in the full length finished surface. With the PROHOLD® tailstock/brake system, this was reduced to .0004” total error. PROHOLD® also manufactures a line of quil advance/retract live center tailstocks for fourth axis VMC’s. For more information regarding our Hydraulic Tailstock Units please fill out the form below and a representative will contact you as soon as possible.